At the 2014 National Pavement Expo, NiteHawk knew they would be handing out plenty of free swag to the patrons visiting their booth. However, instead of the normal free goodies, they decided to raise funds for a cause near and dear to their hearts: the Disabled American Veterans (DAV). NiteHawk created a t-shirt in support of the DAV and asked for $50 donations per shirt with 100% of proceeds going to the DAV. To date, NiteHawk estimates that they have raised close to $2,000. 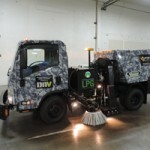 At the show, NiteHawk also introduced two new wraps for their sweeper trucks. The military themed “camouflage wrap” was designed to support the DAV and the NiteHawk 2014 poster. The blue “sky wrap” was designed to show the customers of sweeping contractors that they are green company. on them by February 28, 2014. Please visit http://buysweeperparts.com/DAV for more information and how you can donate to this amazing cause.